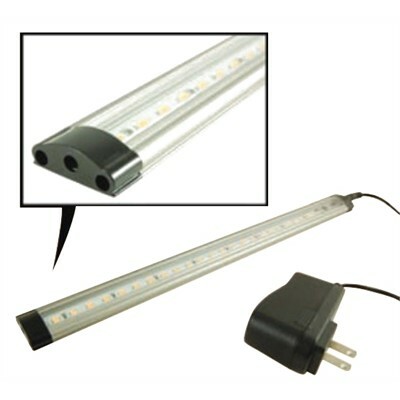 These LED Light Bars can be operated in either a stable bright mode or in a dimmable mode, depending on which end of the LED Light Bar the power supply is connected. To operate in dimmable mode, connect the power supply to the end of the Light Bar where the circuit board is visible. For stable bright mode, connect the power supply to the end opposite the visible circuit board. LED Light Bars may be connected together using either a straight (69−LLA−02) or 90 (69−LLA−03) bar−to−bar connector. However, when connecting multiple LED Light Bars, you must calculate and choose the appropriate power supply according to the power required. Minimum power supply should be more than 20% of the total power required. The absolute maximum value for connecting multiple Light Bars together is 36W, 3A. However, you WILL NOT achieve full brightness at 36W. The ideal, recommended wattage should not exceed 29W for 100% brightness.